The Egyptian government has formally requested that the State Department impose emergency restrictions on the import of Egyptian antiquities into the United States without the appropriate documentation. Since the January 2011 Revolution, massive looting has occurred at every major Egyptian archaeological site, in addition to systematic and organized targeting of museums, government storage units, religious institutions as well as significant illicit excavations. Research by the Antiquities Coalition shows that looting at sites has increased between 500 and 1000% since the January 2011 Revolution. 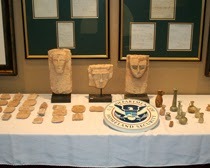 The United States is one of the top markets for the sale of Egyptian antiquities. We urge the Cultural Heritage Advisory Committee (CPAC) to make a positive recommendation to the State Department to halt the import of illicit Egyptian antiquities. A positive recommendation will be important in the fight against cultural racketeering – the systematic and organized looting of archaeological sites by criminal networks. Cultural racketeering is a global issue faced by many countries, including Syria, Libya, Peru, Guatemala and more. The CPAC will begin its review of the cultural property request from the Government of the Arab Republic of Egypt at a hearing on June 2-4. The Public portion of the hearing will occur on June 2. Egypt is the land that gave us the pyramids, Cleopatra, and the Valley of the Kings. Its unrivaled culture has entranced the world, offering us uncountable hours of fascination and enjoyment. Now, it’s time to honor Egypt’s invaluable gifts to the world and rally together to defend some of humanity’s greatest creations. Supporters can submit written comments for the CPAC to consider as part of their determination at the eRulemaking Portal (http://www.regulations.gov), enter the Docket No. DOS-2014-0008, and follow the prompts to submit a comment. All written comments must be received no later than May 14, 2014 at 11:59 p.m. (EDT).